Australia's biggest selling bowhunting magazine. JEFF crouched in the shade amongst the paperbarks as the boar meandered towards him. He was hoping the boar would continue on its present course although to his initial disappointment, it pulled up in a shady spot and bedded up against a log. This only presented him with a shot high in the lungs, if he could place his arrow in a 4 inch area at 35 metres... He knew this was a long shot (in more than one meaning of the phrase) with his newly acquired skills shooting his recurve bow. He decided to take his mates advice if in this situation, and try moving as close as possible... if possible. This was not a well planned and researched hunting trip, but it was to be a new bow hunter's initiation and an older hunter's realisation he might, well, just be a bit rusty. The property we were to hunt on had reported other hunters (actually they were doggers) were hunting the property, but we were still welcome to come on up! After hearing this news, my interest in travelling so far north to hunt a "dogged" property began to wane. I had nearly decided to pull the pin on this part of the trip, when while reading "Bowhunting Down Under" I noticed Strathburn Station's advertisement. I hunted this property back in 1996 and as it had changed hands a couple of times since then, wondered if it would be as good now, as it was then. So as I realistically only had nine full days on the Cape which was to include some fishing, I decided to call the Station's new owner Rory and have a chat about a few days of serious hunting. After consulting with my mate Jeff (who had only been shooting a bow for 6 months), we were able to strike a deal with Rory and suddenly my enthusiasm was restored! Arrows were made, broadheads sharpened, our two recurves and my longbow packed, and within a week we were off! We completed the final 5 hours drive from Cairns to Musgrave, then another 2 hours to the homestead. When we arrived we were welcomed by Alisdair, who is now running the hunting side of the operation. As soon as we pulled up, there were quick introductions, a cool drink was offered, and he suggested we waste no time and head out for a quick hunt before dark. He knew of a cow that had died during calving and the pigs were definitely feeding on it. Bows were strung and we were away. Within 30 minutes we were stalking in a group of hogs all feeding on the carcass. I eased Jeff ahead of me, giving a few quiet tips of encouragement as we stalked in. When we were at about 20 metres, we pulled up and I whispered the obvious, "shoot the big one". As Jeff tried to come to full draw, the shakes hit him and his first ever arrow shot in anger flew a few inches over the boars back. Ah well mate...put it down to a good experience... if you'd killed him, you might get the idea this was an easy way to hunt! The next morning saw us up early and we headed back to the same dead cow. There was a small pig finishing off what was left of the carcass, so we skirted around him and headed to a swamp we could see off in the distance. We immediately spotted a group of pigs nosing around the paperbarks and decided to move in and see if Jeff could get his first hog. By the time we had managed to get within shooting distance, most of them were bedding up in small groups. We had our eye on a group of five as there was a large pig amongst them, when I nearly tripped over a large boar bedded in the long grass. Because of the angle, Jeff had no way of getting a shot away and as I was only 2 metres away, I quickly drew and let an arrow rip. Well the large boar exploded into action, one half disappearing off into the scrub and the other standing up and then falling over dead! It had suddenly transformed into a medium sized sow! 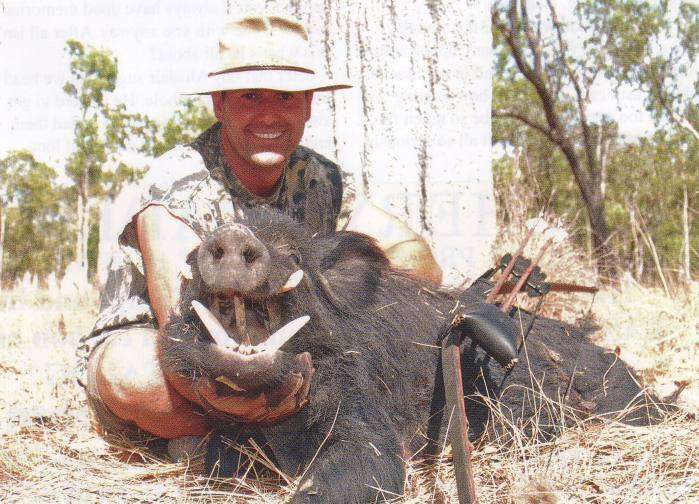 Anyway, the other hogs had all jumped up, looked around and decided nothing was a problem, and as they walked back into the shade, Jeff came to full draw and nailed the largest of the group. We thought he had missed at first, as his arrow passed through its lungs and smacked into a log behind it... then the hog just fell over. Well done mate! First kill, first pig, clean kill! Little did we know that for the next day and a half there would be many opportunities lost by plain inexperience and in my case just plain "rustiness". But that's bow hunting... if it were too easy it wouldn't be so much fun. I learnt years ago not to take it all so seriously. 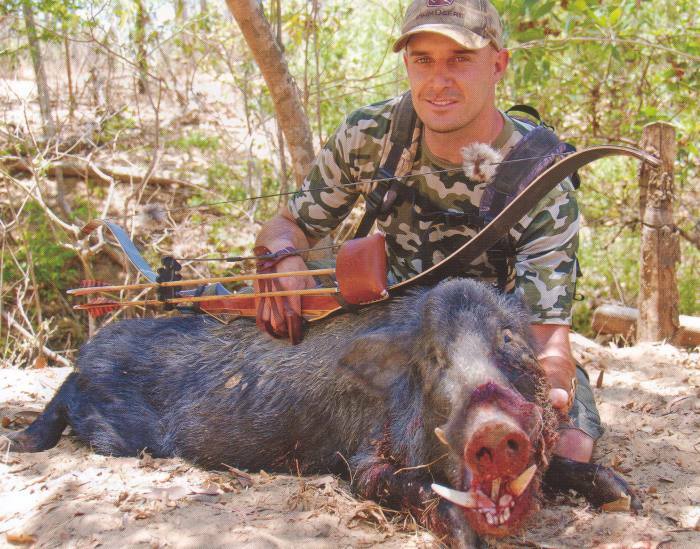 Yes, it's a serious business when you head into the bush intending to take an animals life but isn't the only pressure we need to put on ourselves as bowhunter's, to make sure that you are a capable shot and have sharp broadheads? Just get out there, do your stuff and if it happens, it happens. Let it happen. If you take this advice, and the trophy doesn't happen, you'll always have good memories to take home with you anyway. After all isn't this what's its all about? Later that day Alisdair suggested we head to a spring fed waterhole. He wanted to get away from "family" pigs as he called them and see if we could find a couple of lone boars. He pulled the land cruiser up a few hundred metres away from the waterhole; we checked the breeze and then headed in. We both had a couple more stalks later in the afternoon that ended with the wind changing direction and the boars winding us. That evening over a few ales while touching up our broadheads, we discussed the bad start. We decided that until we had a couple of good boars on the ground, we would not take a shot over 10 metres and put more effort into making the angle of approach as good as it could be into the wind in case of small gusts. Anyway, it was only our first day and look at the action we'd had already! We loaded up the land cruiser and left at day light as we had a 2 hour drive to Flying Fox Creek. On the way we spotted many brumbies, a couple of dingoes and had to winch the cruiser through a steep, dry creek bed. Once out there we checked the wind, dropped into the creek and began weaving our way upstream moving along the top of each bank, depending on the breeze. Glassing the creek banks ahead I spotted a hog bedded up under the shady bank with a fallen tree obscuring a clear view. I planned my stalk and realised I had to back track up the creek bed and approach from the opposite side to keep him from winding me. Stalking the Cape in late October can be a hard ask as it's like walking through cornflakes, although if you wear light shoes like volleys (or bare feet) and keep an even pressure on the outside edge of your foot, it is possible to stay relatively quiet. When I reached the overhanging bank, I realised the only way down would bring me right on top of him only metres from where he was having a snooze. Somehow I managed it and now had to find a shooting lane through the dead branches of the fallen tree. At this angle the arrow would enter behind the last rib and forward into the lung/heart area. After the shot the large hog stood up, took a few steps forward and collapsed head first into the water. I thought "at last! ", but as I approached I realised it was a large loner sow! Later in the day as we were walking into a waterhole I spotted a large boar in the binoculars bedded out in the open again, under a big shady gum. We hatched a quick plan where Jeff would circle out into the scrub so he could get the wind right and use an anthill to cover his approach. His stalk went to plan and eventually he was 15 metres from the boar, with the boar's chest facing him. During this stalk you could see Jeff was now getting the hang of it. 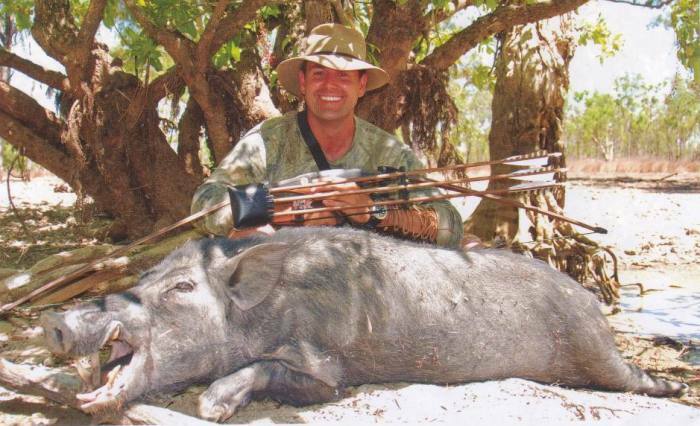 Some hunting experience in the bush is better than any advice you can get... unfortunately his arrow slammed into the tree an inch above the boar. 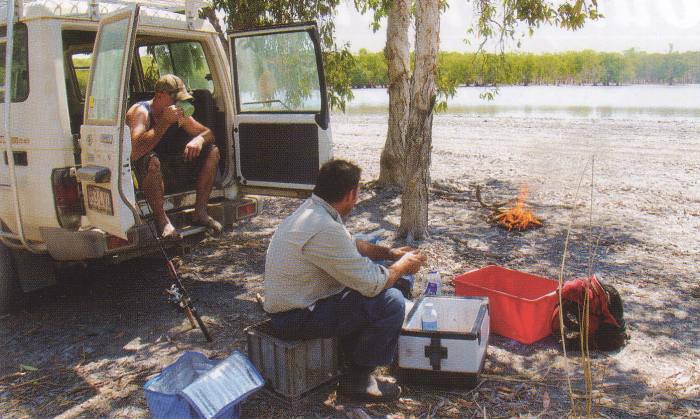 On the way to the next spot, we dropped a couple of yabbie traps in a billabong and had a bit of lunch. We then began a walk into a large swamp to check on yet another cow that had died during calving. And I've gotta tell you, without being too disrespectful, she had died in a perfect position for an ambush! Firstly the surrounding bush underfoot was sandy making the approach very quiet, and she had fallen about 15 metres from two large anthills, and she was downwind of my approach. I couldn't get a clear view of the hogs milling around the carcass, until I had crept up behind the anthills. It was only then I could peer around them to see what was on offer. There were about 15 hogs, mostly in the family hog class, but there was one large boar who was managing to stay behind the others, chewing away on the rotten beast with no clear shot. As I watched, a couple of smaller pigs disappeared right up inside the rotting carcass! I then noticed another larger boar wandering up from the swamp into the scrub about 40 metres away and looked behind me to see if Jeff was following him up. As the boar entered the tree line, Jeff was moving in from the side and then they both disappeared into the bush. When I looked back the large boar that had been chewing on the dead cow, was now walking directly toward me. I looked at the pad next to the anthill I was crouching behind and realised he would pass at about 1 metre if he stayed on the track! I came to full draw behind the anthill so he would not pick me up and as he came into view, he stopped staring at me a split second before my 65# recurve slammed a Blackstump broadhead 3 inches into his head directly between the eyes dropping him in his tracks! Wow! (I was aiming front on to his chest and he walked into it). I was thinking I had killed him with this shot, and then he recovered and leapt to his feet, and as he spun away I slammed another arrow into his chest. He ran 20 metres and fell over... ok, one nice boar on the ground! Jeff had followed up the other boar, flanking him as he wandered back to his bed. Alisdair said it looked as though it would all happen as Jeff was moving into position for a shot, until there was a wind shift and the boar bolted. We had found a new creek system. It was more open forest along the banks with intermittent water and as we moved in slowly to glass into it, we spotted a group of large hogs, mainly boars wandering along the edge of a shady waterhole. The area looked awesome with many intersecting channels and large shady tree's, so we wasted no time back tracking and walking a kilometre or so upwind and then circled back onto the creek into the wind to try and cover as much of it as possible. Five minutes later Jeff was stalking in on a bedded boar. He stalked to about 20 metres and began drawing. I gave him a frown and a quiet whistle, he glanced at me, let down and stalked in to about 10 metres. 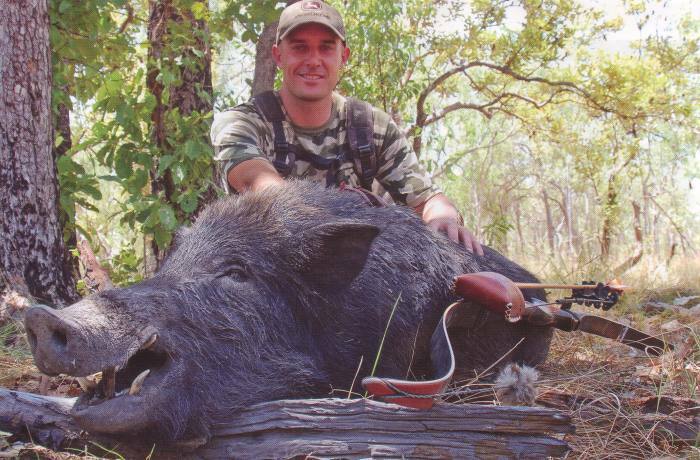 He confidently came to full draw and hit the boar quartering away. The boar leapt to its feet with a roar and stood chomping his jaws. At the time I thought, "Whoa, this doesn't look good!" Then Jeff slams another arrow into his lungs and the boar trots off and leans on a tree, and then beds down about 50 metres away. We watched him for about 20 minutes waiting for him to expire as both shots looked good. 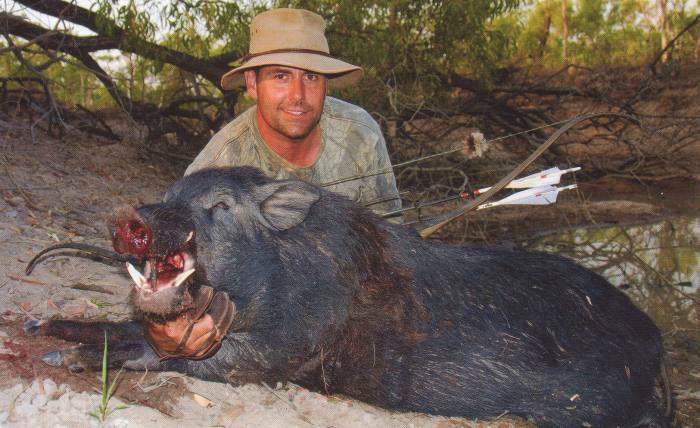 Jeff eventually moved back in and finished off his second kill ever, and his first trophy class boar! Well done mate! On the way back to the Station, we collected our yabbie pots. 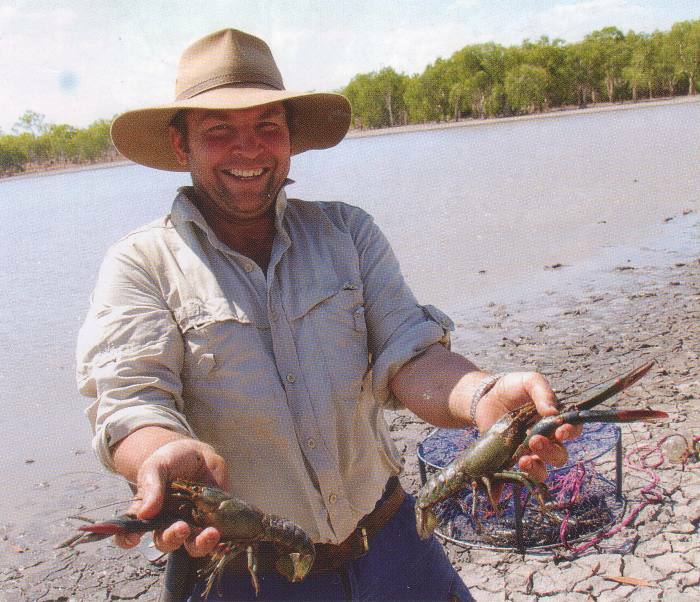 Lucky the cattle contractors were working Strathburn, as we had enough yabbies to feed an army! The feed of yabbies that night washed down with few "XXXX" ales was a great way to finish a great day! 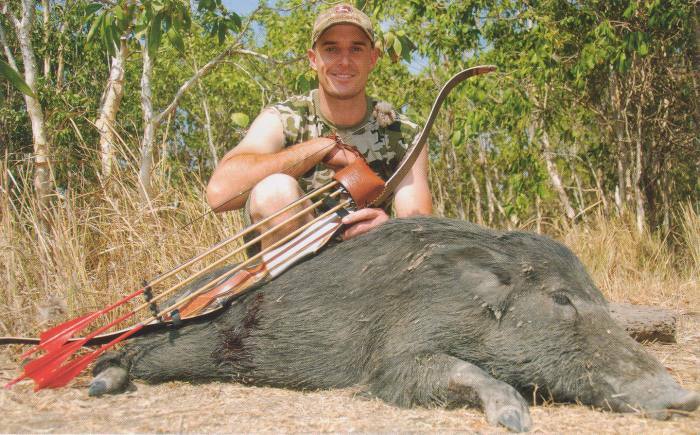 I had decided before I left home that after I had killed two boars with my recurve, I would then hunt with my longbow. I had looked forward to this day for a long time. 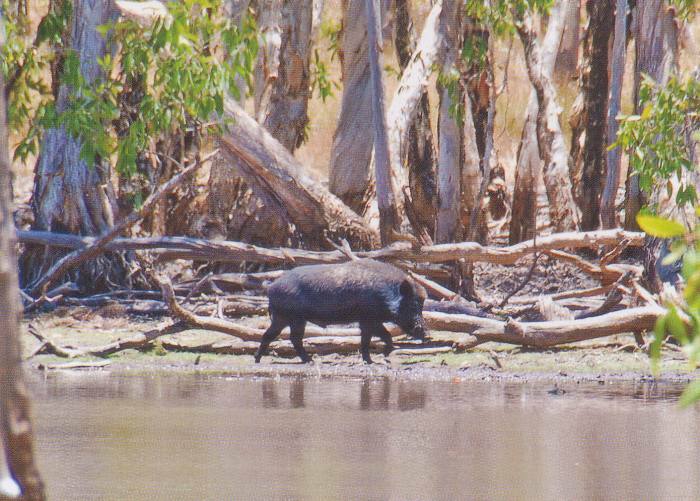 The morning was just beginning to heat up when Jeff spotted a very large boar bedded under a tree on a billabong. He had to skirt right around and come in from behind. We watched as he executed a perfect stalk and was looking for an opening for a shot, when the wind changed and the boar was gone! Because the Cape is heating up in late October, the wind can be a bit gusty and unpredictable. But with the number of hogs we were seeing on Strathburn, it really didn't matter much, we still were getting heaps of opportunities and having a ball! We were travelling to another remote swamp that Alisdair had found while scouting the property. He hadn't taken any hunters into this swamp before and he was quietly confident there would be a few good boars in there. On the way he casually mentioned that every time he checked out a waterhole on the way off to the left of the track about this time of the day, he had seen a boar having a snooze under a what looked like a freshwater mangrove tree. He thought I should sneak in and see if he was there. The boar was facing away from me as I crept up behind him. I tested the wind with the powder puffer... perfect. The noisy leaf litter began to thin out and then I was on a sandy cattle pad, making my approach virtually silent. I knew then I could get to about 10 metres. There is such a thing as too close, and I had to consciously stop myself. At about 10 metres I drew the self made tapered timber arrow and sent the 160 grain grizzly broadhead angling forward into his chest cavity. He took off and ran 20 metres before nose diving into the dirt. Never knew what hit him. Awesome! My first longbow boar! I was stoked! And he was trophy class. We had a couple of kilometres to walk into the remote swamp. We came over a small hill and looking down through the tee tree into the swamp, we immediately were glassing numerous boars feeding out in the middle or wandering the banks. Jeff moved ahead and we could see that he was on a mission. He had crammed a lot of experience into the last 4 days. I was thinking about how our decision to hunt Strathburn had been a good one. Lately life is so busy and disappearing for a few weeks just isn't an option anymore. A place like Strathburn is perfect when the available time away is an issue and for a new bowhunter like Jeff, (and a rusty one like me) the abundance of game can fast track experience and success. So getting back to Jeff's hunt at the beginning of this story, after following that boar around for an hour and a half, he eventually let it happen, and made it happen and his arrow took out the big boar's heart. So on the first evening let's face it, he didn't have much of an idea, but by day four he managed to not only hunt well, but execute the shot when it mattered. I reckon that makes him a quick learner and a bowhunter! We decided to take the rest of our last day quietly and stop at a couple of billabongs and flick a few lures to see if we could pick up a barra for lunch. 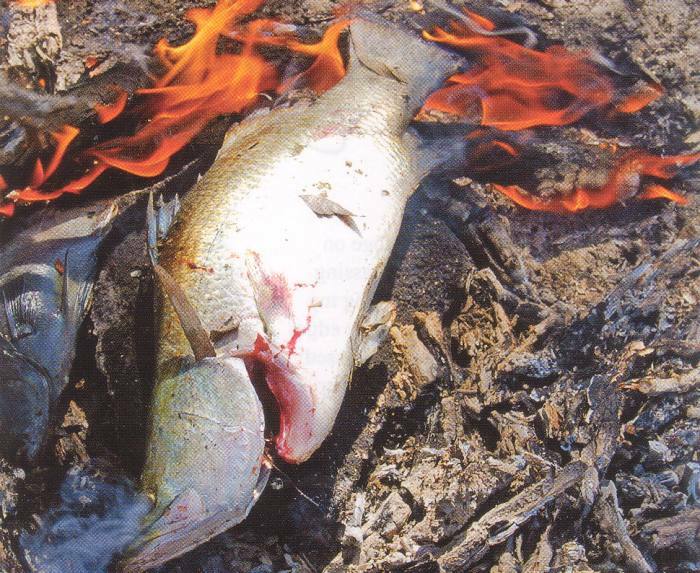 We hooked up a couple and then cooked them up the native way (straight on the coals, and then peel back the skin). We packed up and began heading for the homestead. I told the boys I wouldn't mind having one last hunt on the way home to finish off our last 4 days. Alisdair said we would cross a creek a little further up the track which always looked good, although we should only have a quick walk as we had a long drive back. We geared up and disappeared up the creek. I had only walked 100 metres or so and as I rounded a bend there was a large tusky boar stretched out in the open facing me. The boys stayed back to watch in the cool shade of a tree, while I backed off to get the wind right and then approached him from the side. He was awake so getting too close wasn't an option. Using an anthill as cover I narrowed the gap to 15 metres, came to full draw and buried a timber shaft down into his lungs. As the boar took off, I noticed that the shot may have been a little high, but it was angling down into his chest. He travelled about 100 metres and lay down. I watched him through the binoculars for a while and as he looked to be dead, I stalked in to finish him off. When I reached about 10 metres I was just drawing a finishing arrow, when he jumped up and took off at a trot. The arrow hadn't penetrated out the chest and as it was angling down I figured the blood trail would be near non-existent. As the boar didn't look too healthy and against my better judgement, I began following at a trot hoping he would pull up and give me another shot (I know... but it seemed like a good idea at the time). After 100 metres or so he suddenly stopped and wheeled around chomping his jaws. I already had an arrow on the string and as he turned to go again, I drew and sent an arrow perfectly broadside which passed through both lungs, never to be seen again. The big boar took a couple of steps and his big heart gave way and he collapsed. It was a great way to end our 4 days on Strathburn! Thanks to Rory for arranging the trip at such short notice and to Alisdair for putting up with us! These guy's have put together a great experience. 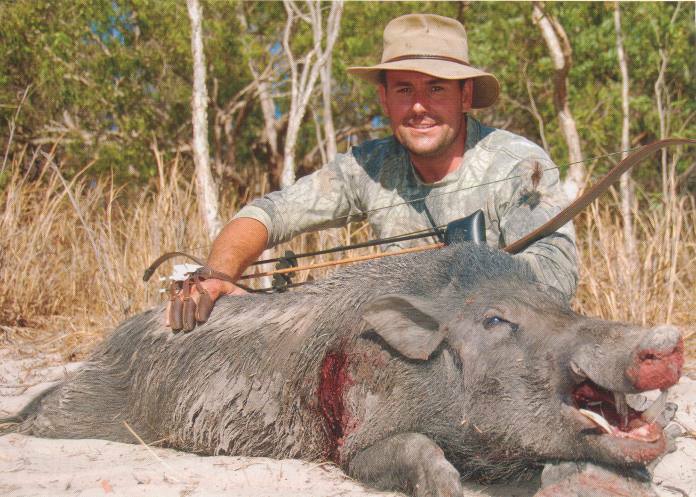 The boar hunting is great and freshwater barra fishing is also available. The scenery ranges from Savannah to some of the most beautiful lily covered paperbark swamps and billabongs, with prolific birdlife. Alisdair will give you as much attention as you need, or in our case he just put us in the good spots then stayed back and let us do our thing. Just the way we like it!